That was my grandmother’s word for when a person is so stunned, it renders her slack-jawed and mute. I haven’t experienced this many times in my life, as I’m a decidedly sanguine person, but at the moment, I was definitely thunderstruck. As a professional genealogist, I’ve seen enough skeletons come dancing out of family closets to get an impressive conga line forming. But they’ve all been metaphorical skeletons. Until today. I stood on a berm of red dirt in our potential new client’s backyard, only a few miles from where I live in Morningside, North Carolina. I stared down into the hole the backhoe had ripped, and even though I’d been warned, I was shocked senseless. There was a skull grinning up at me, and while this was disconcerting enough, what really got me was the casket. It was made of glass in a milky green color and was broken in multiple places, the shards sticking out like spikes. The metal hinges were rusted and twisted and what was left of the lid had slid to the side. Tatters of rotted fabric sprouted from the pile of wreckage like desiccated seaweed. A jagged hole where the backhoe’s scooper had hit left a handy window for our macabre game of peekaboo with the grinning skull. The whole casket had settled wonky. It canted to one side as if the occupant had rolled over in his big sleep and taken the casket with him. “Dear sweet Lord, have mercy,” my business partner, Esme Sabatier, whispered. For the first time in weeks, she and I were in total agreement. Esme’s been my cohort in our genealogy research business for several years, but more than that, she’s my housemate, my confidant, and my dearest friend. She’s my family. We’re great partners because we have complementary outlooks and skills. But the sprockets on gears are complementary, too, and if they don’t line up just right, there’s a lot of grinding. We’d been out of alignment lately. This weird casket and its tenant were the most disturbing things Esme and I had witnessed today, but not the only jolt we’d had. We’d been snug in our beds this morning, minding our own business and trying to recover the sleep we’d lost over the past two weeks while on a job for a big Italian family in Maryland. We’d gotten in late last night, so exhausted we’d dumped our suitcases in the front hall and gone straight to bed. A little after 8:00 a.m., which to my sleep-deprived brain was an ungodly hour, someone started mashing on our doorbell. I’d put my pillow over my head, but it didn’t let up. Defeated, I’d hauled out and trudged downstairs, muttering old Sicilian curses I’d recently learned at whoever was leaning on the bell. I threw the door open to find Jennifer Jeffers standing on our front porch. Jennifer is the last person in the entire population of our little town who would pay a social call on Esme and me. She dislikes us—rather intensely—for some reason neither of us can fathom. True, we hadn’t met under the best of circumstances. Three years ago, one of our clients had been murdered, and for a brief time, Esme and I were deemed persons of interest since we’d been among the last to see her alive. Jennifer and her partner, Denny, had been the detectives on the case and had come to question us. We were quickly cleared, so I couldn’t see why Jennifer would still hold that incident against us. Denny certainly hadn’t. As soon as they’d eliminated us as suspects, Esme had become a person of immense interest to Denny. But Jennifer is still so unfriendly toward us. We’ve tried being sweet to her, we’ve tried giving as good as we got from her, and we’ve tried analyzing every interaction with her to see if we could get any insight into the problem. Nothing had gotten us any closer to understanding what we’d done to offend her so much. These days, we did our best to ignore her. Jennifer’s the youngest person ever to make detective in the police department, and quite the overachiever. Her partner, Denton Carlson, is Esme’s boyfriend, though that sounds like a silly term when you know them both. Esme is a beautiful ­Creole woman in her fifties and she’s substantial and statuesque—­over six feet tall in her stocking feet and fond of heels. Denny is the same age and is a Mack truck of a man. They are a formidable-looking pair. I, on the other hand, am short and small, much like Jennifer Jeffers. When we’d first met, I’d had the brief idea we had some short-girl solidarity going, but she soon disabused me of that notion. So, to see her standing on our front porch in off-duty clothes was a surprise. And what came out of her mouth after I gave her a puzzled hello was even more surprising. I stood for a moment trying to process what she’d said, thinking I must still be sleeping and that this was a dream, or a nightmare ramping up. “It’s not for me, it’s for my dad,” she said when I didn’t respond. “And what is it we can do for you, or him, exactly?” I asked hesitantly. “It’ll take some explaining,” Jenny said. “No, thanks,” Jenny said, clearly uncomfortable. As we went into the kitchen, I could hear Esme muttering as she descended from the mother-in-law suite on her side of the house. “Who was that mashing that doorbell so early in the morning? Don’t they have any—” She halted mid-grumble at the bottom of the steps and reared back as if a sudden wind had pushed against her when she caught sight of Jenny. She looked to me for an explanation. “Have a seat,” I said, turning back to Jenny. She stood, shifting her weight from one foot to the other, looking like she’d rather be getting a root canal. We waited, enshrouded in what had to be the most awkward silence ever, until the coffeepot gurgled and Esme snatched it up and poured. “You sure you don’t want a cup?” I asked Jenny. “Fine, if it will speed this up, I’ll take one,” Jenny said, taking the cup from Esme, who, with uncharacteristic ungraciousness, held it out only slightly, making Jenny come get it. “Now, what’s this about?” Esme asked as she settled at the table, making a fuss of rearranging the cream pitcher and sugar bowl. I nodded. Esme rolled her eyes. And so we did. You can’t dangle the words glass coffin in front of genealogists without arousing a certain level of curiosity. Meeting Jennifer’s dad was yet another surprise for the day. He wasn’t at all what I’d expected. Jennifer is a straitlaced gal, conservative in dress, measured in her movements, and taciturn in speech. She’s very self-contained. He had a two-day scruff of whiskers and was dressed in well-worn blue jeans and an old Pink Floyd T-shirt, topped with a flannel jacket that looked soft from many washings. His gray hair was pulled back in a braid that hung a few inches down his back and the fan of wrinkles around his eyes documented a lot of time spent laughing. “Jenny’s talked so much about you two and how good you are at finding out things that happened years ago, I thought you’d be the ones to help me figure out who my mystery man is.” He turned and pointed to a pile of dirt at the top of a gradually sloping acre of side yard and gestured for us to follow him. “Maybe Jennifer’s adopted,” Esme whispered out of the side of her mouth. “And the coffin is actually glass?” I asked. “I’ve heard of those but never actually seen one. Have you?” I asked, turning to Esme, who didn’t reply. “Have you, Esme?” I asked again. Picking our way along the newly turned dirt where River was putting in not only a vegetable garden but also trees, flower beds, and an elaborate trellis structure was slowgoing. Esme, as was her wont, had worn high heels, this pair in a leopard-skin design and completely inappropriate for the terrain. She kept sinking into the loose earth and then having to extricate her footwear. As we walked, Jennifer came from the direction of the house and fell into step with us. Arriving at the hole, we stood around the grave, a peculiar party of mourners, staring down at a stranger who seemed to be staring back, mocking us from his ruptured glass casket. After I finally got my wits about me, I looked away from the skull and began studying the characteristics of the casket. The glass was opaque in a color that reminded me of old green Coke bottles marbled with ivory veining. There was no burial vault, so the grave was likely an old one. Something about the look on Jennifer’s face made me feel bad for her. It was as if she felt she’d failed her father. I watched Esme’s face twist into a murderous glare. Esme opened her mouth, no doubt to express the opinion that Jenny’s mother had failed miserably, but I rushed to cut in. “Would you mind letting me review your deed and title?” I asked. We all looked up as a van came down the long gravel driveway, kicking up a cloud of red dust. “Finally,” Jennifer said. “That’s the medical examiner.” She marched off toward the van while Esme and I turned our attention back to the casket. “The glass is pretty if you can get over what it is,” Esme said, tilting her head to one side. I shushed her, but she had a point. “I’m gonna make some more calls,” Jennifer said, whipping her cell phone from her pocket. “I can’t believe they sent Opie,” she muttered as she walked away. River accompanied us back to our car and we chatted for a few more minutes. I told him we’d do a little investigating and I’d let him know tomorrow if we could be of any help. We talked fees and I was surprised when he didn’t blink. Esme and I don’t come cheap. But we also don’t take on jobs where we can’t provide any value. Hard as it is for me to accept, there are some things that are simply lost in the fog of history. “Maybe there was wind the day the Jennifer apple fell,” I said with a smile. "Brynn Bonner ingeniously tosses in clues to keep guesses coming. 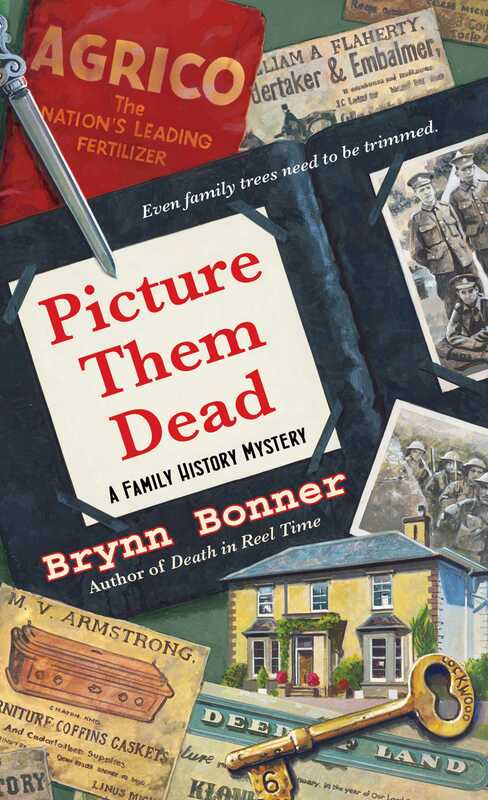 PICTURE THEM DEAD is grippingly mysterious." "This one is a whole lot of fun from start to finish."